My last post about young writing projects turned my mind towards thinking about another small obsession of mine: maps. Historical maps, speculative maps, fantasy maps. There’s something about maps that fired my imagination as a child and still does today. Maps are fascinating artefacts. For all their claims to representing the real world, they’re just as surely artistic endeavours that result from a series of choices made on the part of the cartographer; choices like naming and colour and notation. Like writing, maps embed narratives, can suggest stories. 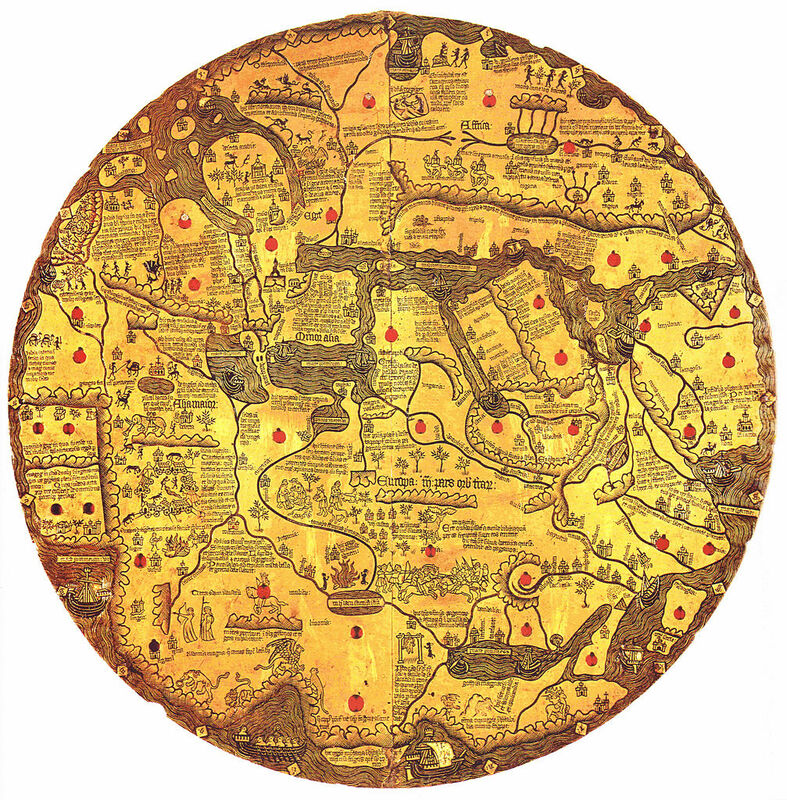 A medieval mappa mundi marries geography and chronology in a weird symbolic system that takes whole scholarly monographs to sort out. The map on an overleaf in a fantasy novel is an enticement and a promise and a one-glance summary. Maps can do all sorts of things. I doubt my early efforts exploited all of them. The more I look at it, the less I’m pleased by my map of Prydain. There are a few errors, and at least one egregious misspelling. After a discussion with Marie (the podcast, remember? ), I decided to have another go at it. I haven’t attempted a “realistic” map, this time; it doesn’t seem appropriate for Prydain, and working out an accurate scale would take much more time than I’m willing to commit. I’ve used the Gough Map of the British Isles as my basis for style and geography. I have no idea why I didn’t think of this before, as the Gough Map’s representation of Wales fits much closer to the geography as described in The Chronicles of Prydain than any modern map. And, of course, I went back to the books to get a better grasp on the relative locations of key places in Prydain. Thanks to Marie for help with this new map. I drew it the same day as we recorded the podcast. I was never happy with the maps included in the hardcover editions of Lloyd Alexander’s The Chronicles of Prydain. Evaline Ness is a fine artist, but the Prydain maps were rough affairs that changed from book to book, reshuffling locations while erasing others. My own paperback editions don’t include maps, and newer editions drop them as well. The only other Prydain map I know of lies in The Dictionary of Imaginary Places. While the descriptive text is excellent, as are all the entries in the Dictionary, the actual map is beyond awful. The cartographer places the Marshes of Morva directly west of Caer Dallben, sticks Annuvin south of the Great Avren River, and plunks the Forest of Idris there as well. These placements are completely out of whack, and it seems James Cook hadn’t even paid attention to the entry itself. The map is also, unfortunately, a full-page spread, so there really isn’t an excuse for such sloppiness. In light of my disappointment with the Dictionary I went searching for a complete map of Prydain. Eventually I stumbled across a post concerning Prydain geography. 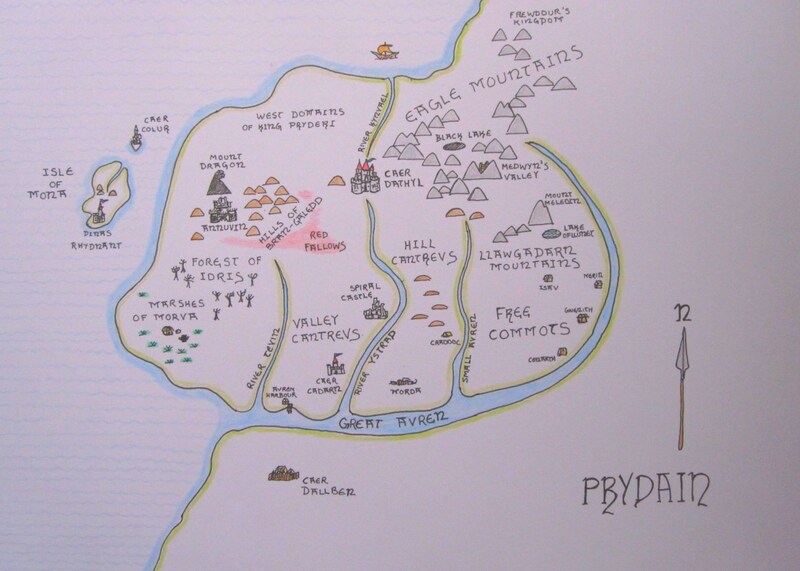 Lotesse created a composite map from the four extent maps of Prydain to help get a better grasp on the place. After seeing that, I thought: why not draw my own map of Prydain based on Eveline Ness’s maps, Lotesse’s work and my own knowledge of the novels?